Why Choose Saint Rose for Bachelor of Arts in Mathematics? Often called “the Queen of Sciences,” mathematics develops your quantitative and analytical abilities like nothing else can. Math is what we use to make sense of our physical world and discover the laws of nature. The core discipline and last word in science, technology, engineering, and math (STEM), math hones your critical thinking, logical reasoning, and problem-solving to the sharpest focus. 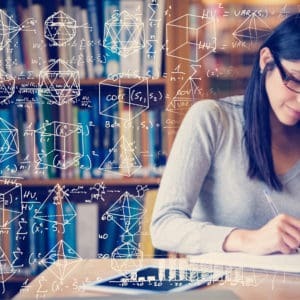 And the study of math provides you with a solid foundation and competitive edge for a career in a huge variety of fields throughout government, academia, and industry: Business, banking, finance, law, computer science, engineering, medicine, technology, and the natural sciences are only a few. Whether or not you pursue graduate work, your rigorous math training will serve as a strong foundation for your career, whether you want to be a data analyst, systems designer, investment manager, accountant, economist, teacher, or research scientist. At Saint Rose, our faculty are passionate about sharing their knowledge and love of math, helping you appreciate the elegance of math itself and learning about its myriad applications to the world around us, from gaming to chemotherapy modeling to fintech big data. You’ll also find we’re committed to applying math knowledge to help the greater community, such as improving STEM education for women and minorities, for which Saint Rose – with its strong teaching tradition and socially minded community – provides the perfect environment. Associate Professor of Mathematics Amina Eladdadi is an applied mathematician who developed a model that maps the growth of breast tumors and influences treatment decisions. She shows her students that math is about more than numbers. Calculus: Differential calculus: Student will be able to compute, apply and reason about derivatives, partial derivatives integrals, multiple integrals, sequences, and series. In differential Equations, student will be able to solve differential equations and initial value problems. In Calculus III the Students will be able to work with functions of multiple variables. As well as solve problems in 3 dimensional analytic geometry as well as work with vectors in 3-space. In Analysis, student will be able to write formal arguments proving facts about the real numbers, sequences, series, limits, derivative, integrals and continuity. Probability: Students will demonstrate familiarity with the probability axioms by being able to solve probability problems involving counting methods, conditional probability, discrete and continuous random variables. Students will be able to choose the correct probability model and calculate probabilities, for various distributions. Students will be able to compute mathematical expectation and find means and variances for various distributions. Students will be able to find moment-generating functions and use them correctly to compute means and variances. Students will be able to demonstrate familiarity with the Central Limit Theorem. Algebra: In Abstract Algebra students will become familiar with the structure of mathematics through engagement with concepts of group, ring, and field theory. Students will be able to apply bijections on sets and identify group homomorphism, isomorphism, authomorphism together with its operators. The historical development of algebra will be measured through projects and presentations. Linear Algebra encompasses finite dimensional vector spaces; linear transformations of a vector space and the representation of these transformations by matrices, determinants, eigenvalues and eigenvectors and students will demonstrate knowledge of and facility with these topics. Geometries: Students will understand the role of axioms, definitions, and theorems through the study of Euclidean, non-Euclidean, affine, and finite geometry through synthetic, axiomatic, and transformational approaches. This will be accomplished through the extensive use of interactive geometric software and development of proofs. Presentations of individual projects and historical perspectives will be evaluated. Mathematical Modeling with Discrete Mathematics and Statistics: Students will understand and develop facility in the use of statistical concepts from measures of central tendency and sampling through hypothesis testing. Students will develop facility in modeling real-world situations through statistics and topics in discrete mathematics (logic, set theory, informal and formal proof, management science, and modern graph theory). Foundations: Students will demonstrate mastery of the basics underlying advanced mathematics including logic, sets, and functions; relations and equivalence relations; rational, irrational, and complex number systems; mathematical induction proofs; and the development of the cardinal and ordinal numbers. Proof: Students will be able to understand theorems in a variety of contents and will eventually be expected to write formal proofs. By senior year students will be able to write clear and appropriate proofs, including both direct and indirect proofs. Problem solving: Students will solve theoretical and applied problems, using the techniques specified in the content portions of all major courses. Problems will range from routine calculations to open-ended investigations, depending on the instructor and the content.